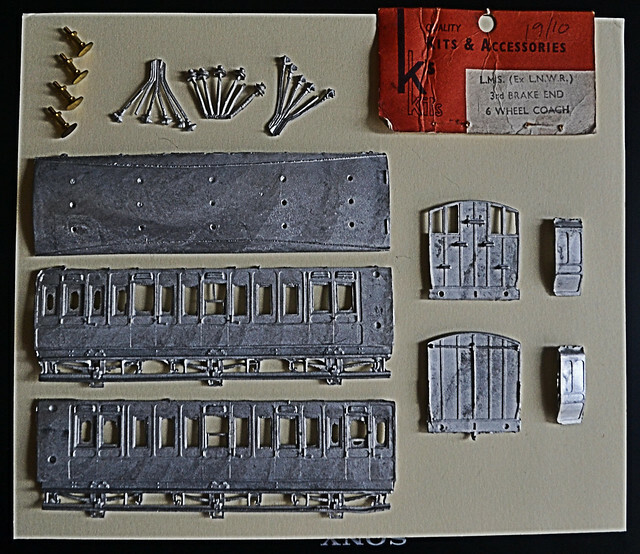 I recently acquired three Keyser LNWR 6-wheel coach kits. I had been trying to get some for the best part of a decade but they are the scarcest of the Keyser coach kits, do not arise that frequently on eBay and when they do, they can be unrealistically expensive. I was extremely fortunate to be given some by an RMWebber however, an exceptionally generous gesture which simply required in return a donation to a charity of my choice. I'm still staggered by that person's kindness. Later releases of the kits [the ones I'm building are earlier ones] frequently suffer from worn moulds and show considerable distortion. The photo below shows what I mean. I bit the bullet on this eBay sale and paid £23 for it. The price on the card [19/10] dates it from the mid-60's. The body sides show both bad distortion at the ends and also on the chassis frames. In both cases this will be extremely difficult to resolve. A recent attempt to straighten the frames and clean out the flashing / webbing around the springs resulted in everything just falling apart, the metal being too weak. I cut the frames away entirely and will use a Ratio four-wheel chassis to rebuild it at some time in the future. These models look simple: they can be extremely challenging however, in spite of their limited number of parts. And getting the 'chassis' to sit squarely is another matter altogether! The kits, each of the three different models introduced by Keyser in the late '50s at 18/- each [and these are probably from then], arrived partly assembled and although bent, battered and partially primed, complete. Steeping them in caustic soda for half an hour removed both glue and undercoat and very little fettling was needed to restore their shape. A little dressing with a file was all that was required. A good start. This is the sort of condition that the three arrived in [after the sides were bent back into shape] and, below, what they looked like, typically, after dismantling and cleaning. The first photo is an All-Third and the second the Full Brake. 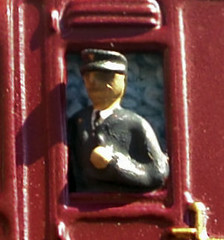 The Brake has had the guard cut away from one side as Keyser moulded him looking out of both windows simultaneously! All of the coaches were fitted with really quite nice metal Mansell-type wheels: too good to bin. These were Keyser originals, the riveted Mansell inserts being just that, metal disks which could be attached or not. The wheels needed stripping of paint also and the axles will be given pin-points in due course by inserting them into a mini-drill and filing them into a point [they are blunt, very much the style of the time]. Whether the centre wheel-sets remain flanged is yet to be decided. Floors, glazing and interior partitions will also be required. I do not intend building all three within the competition timescale, just one certainly and possibly two if time permits. The first one will be the attractive Full Brake. It, like the others, will run in a slightly stylised late-30's / early-40's LMS livery. The final photo shows one of the sides given a test paint and lining. The paint is Rover Damask Red [Halfords rattle-can] and the lining is by Pressfix. This is a test livery only and it will change slightly. I may - may - also decide to line with a bow pen as it is far easier than stringing out fine and fragile lining in a straight line [even though it looks quite reasonable I think]. Excuse the dust and gluey residue on the decals - it has since been removed. So, this is where I'm starting from, but don't expect anything more for a while!!! Last edited by Lysander on Thu Apr 19, 2018 12:22 pm, edited 5 times in total. Looking forward to seeing them come together. Thanks for that. 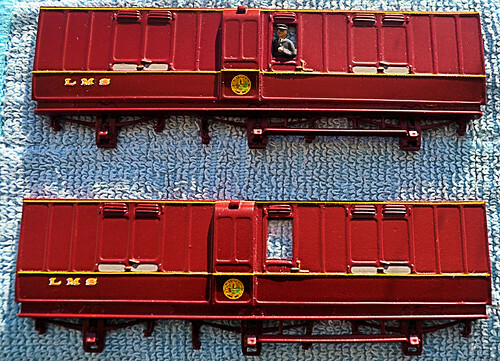 The problem with building these coaches is that the relative scarcity of the models means that there are almost no photographs at all of them on line. One or two in LNWR livery and that’s it. Had these 6 wheelers survived in use in the ‘40s, they wouldn’t even have seen use on secondary services, they would have been relegated to miners’ or engineers’ trains most probably and so were unlikely to have been repainted at any time during the previous 20 years. The livery I’m using is thus somewhat speculative and based on an assumption that some were still earning revenue on branch or unimportant suburban lines. Rule One allows absolute licence!!!! So much in kit building is about problem solving. I had not intended touching the roof of the Brake for a while but the issue of glazing just niggled away. Finishing the model was never going to be dependant on glazing the sky-lights, but every attempt had to be made to at least try to glaze them neatly as they are such a visible feature and gaping empty holes would just look awful [see the earlier photo]. Before commencing, I primed the roof and then sprayed it with Halford's Matt Black, then masking up the top to spray below the rain strips with Grey Primer again. Glazing from underneath was not an option as the 'glass' would lie at least 2mm below the top of the roof. I tried flush-glazing, cutting inserts to fit within the frame, but was defeated by the different sizes of each of the four frames and no idea as to how to glue them in anyway. But then I realised that the openings could quite effectively be flush-glazed from above. This was the easiest option and four pieces of shirt-box type thin perspex were cut, bent in half at about 30 degrees and then finally trimmed to fit the upper openings. Each was then glued into place using Johnson's 'Klear' and allowed to dry before a frame was drawn around each one, in matt black paint, with a bow pen. A good result I think. But is all of this just providing a distraction from lining the second side? I think it may be.....! Last edited by Lysander on Thu Apr 19, 2018 12:23 pm, edited 1 time in total. A nice result there Tony. me to even try one. A little progress to show. The sides have been painted and lettered, and varnished, although the solebars and chassis will not be sprayed black until the body has been assembled around the yet-to-be measured and cut floor. The closed Guard's window has been glazed and the Guard painted, too. He was a difficult one to do as the depth of the moulding was quite shallow and so his surface detail was rather flat. Consequently, he looks far better in OO from two or three feet than he does in the enlarged photo!! The wheels have also been painted, after giving two axles pinpoints and removing the flanges from the third. The ends have also been painted black. The inserts improve the appearance of the wheels hugely. I've enough of them to fit the three coaches. I've been thinking about how expensive that 19/10d would have been in the mid 1960's. 5 gallons to safely do Southampton - Poole return, getting 16-18 MPG. Smiled at the flangeless 'Mod' I have 6 items so modified that all run safely on 1st radius. Anyway great paint & decal finish, indicating that finished coach will be superb. Thanks Geoff. These things were expensive, but perhaps not as eye-watering as Trix OO locos were in the ‘50s - more than a week’s wages for the average man. Dublo was expensive also, one of the reasons why Triang took off so well. I’m looking forward to seeing how well the outer wheel sets sit in this coach as they will determine the running quality. The central set will just float. Removing the flanges is a bit of a cheat, but it does ensure easy running for a rigid six wheel chassis. Hopefully the floor will be cut tomorrow and a dry run with rubber bands will be possible. Dad-1 wrote: I've been thinking about how expensive that 19/10d would have been in the mid 1960's. IDK about the UK, but here in AU exchange regardless I recall the change in value of what an AU pound would buy in early 1964 vs late 1966 had significantly lessened after a lengthy period of notable economic stability preceding. UK 19s/10d would have represented a sizeable sum for any single kit, prohibitive to a pocket money dependent budget except perhaps to the most miserly who would be unlikely to splurge such a saving. Trying to remember how much Airfix's original Series Five B-17G 1/72 Flying Fortress kit (1964 mould, '65 availability here as memory serves) was by way of value comparison back then, but can't recall. I think my Ki-46 II "Dinah" Series Two kit which came in a box rather than a bag was priced at about the AU 6s/- mark everywhere at that time, and that was a rare treat and considered purchase at almost double the price of a bagged kit in early '66. In '66, I received this as a birthday gift from my dad, an extraordinarily generous present for the day, and unusually so as the rule. Price was a whopping AU£17/10s without controller/transformer, a sizeable grey powder coated steel box which had to be purchased seperately back in the day. 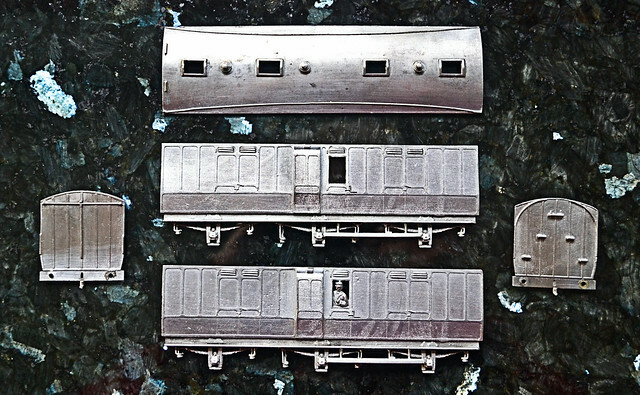 Those Triang diesels are extremely collectable now - do you still have your’s? Something else which conspired to make models expensive in the ‘40s and ‘50s was manufacturers’ frequent practice of selling locos and tenders separately. I never understood why, other than as a ploy to increase income. Obviously they eventually wised up to the folly and public impatience. Lysander wrote: Those Triang diesels are extremely collectable now - do you still have your’s? No. Stunning looker for its day, but wasn't a good runner actually. Wheel slip under load and gutless. 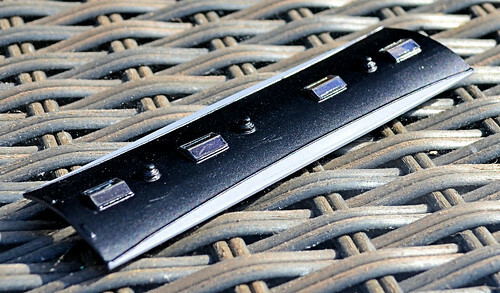 Those coach parts are looking ace! Thank you. A floor was cut today and one side and the two ends attached to it. Bearings were adapted for the axle boxes and super glued in. A dry run with the wheels inserted and the second side held on with a rubber band showed square and free running. Tomorrow I’ll Spray the underframe and solebars black, fit the wheels into the sides and attach the final side. The roof will then go on. Stunning paint job. I might as well give up now, my entry will be worse than last times "also ran" and probably end up as a "the vet has been called to put him out of his misery"